Atahba is a Khajiit commoner who takes care of the horses at Five Riders Stables outside Leyawiin. 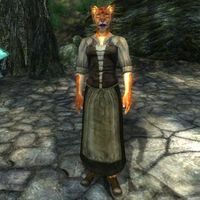 A Khajiit of few words, Atahba spends most of her time tending the horses, while pointing potential customers towards her employer Cat-Face. She sleeps inside the stables every night between midnight and 6am and will start the day by taking a breath of fresh air outside. At 8am, her workday begins, and she starts raking the ground inside the pen. She stops at noon and sits down on the porch for a two-hour lunch. She gets up again at 2pm and spends all afternoon wandering around near the stables, on the look out for customers. At 6pm she once again sits down on the porch, this time to enjoy a two-hour dinner. At 8pm, with the stables closed and not much to do, she just loiters lazily around the pen until her bedtime at 10pm. She wields an iron war axe and wears a set of lower-class clothing: a shirt with suspenders with breeches and clogs. She also carries her rake and a small amount of gold. When you approach her, she will point you towards Cat-Face with the words: "I can't sell you any horseflesh. You'll have to go inside and talk to Cat Face [sic]." If you buy a horse, Cat-Face will say: "Atahba will have your Paint horse saddled and ready outside." Atahba will then break off her schedule and wait for you outside the stables, with a horse by her side. When she sees you, she will comment: "You have purchased a fine piece of horseflesh." If you manage to speak with her before hearing this comment (see bugs) she will say: "He may look slow... okay, he is slow. But what do you expect for this price?" As soon as you mount the horse, she will return to her usual routine. Atahba has both an unused greeting and an unused response to the Leyawiin topic, neither of which are voiced. The greeting is fairly similar to the one heard in-game: "I'm Atahba. But if you want a horse, you got to talk to Cat-Face." Her Leyawiin topic would've went as follows: "Well, if you want to know what I think, I think it stinks. The Elder Council takes the Trans-Niben and just gives it to Cyrodiil! Have you ever seen a map with the Trans-Niben in Cyrodiil? No! Because there's never been one like that. Damn crooked Councilor. Some men rob you with a sword; others rob you with a goose quill pen." Due to an odd script, only one of Atahba's two post-purchase dialogue lines can be heard, and only once. This page was last modified on 2 December 2018, at 17:18.